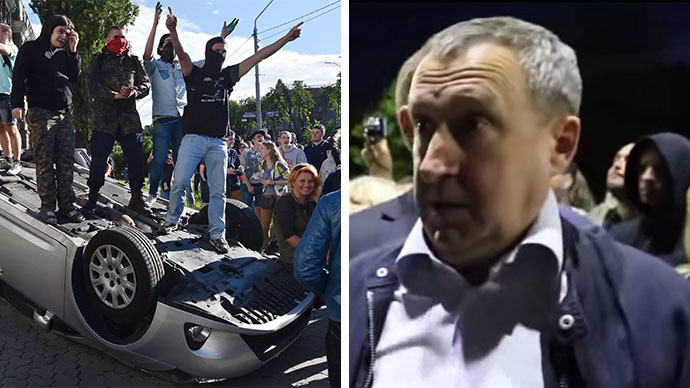 Ukraine’s foreign minister, Andrey Deshchitsa, who called President Putin a “f**ker” in a chat with protesters who vandalized the Russian embassy last week, has been fired. His new posting, however, could be as ambassador, perhaps even to Moscow. A total of 319 Ukrainian MPs voted in favor of firing Deshchitsa on Thursday, well above the required simple majority of 226 votes. Meanwhile, newly-elected President Petro Poroshenko declared that he wanted to thank the former FM by offering him another diplomatic posting. “I want to separately thank Andrey Bogdanovich Deshchitsa. I can say that I offered him to head one of Ukraine’s foreign diplomatic missions and he accepted the offer,” Poroshenko said after the parliamentary vote. Poroshenko did not specify which country Deshchitsa would be sent to, however. 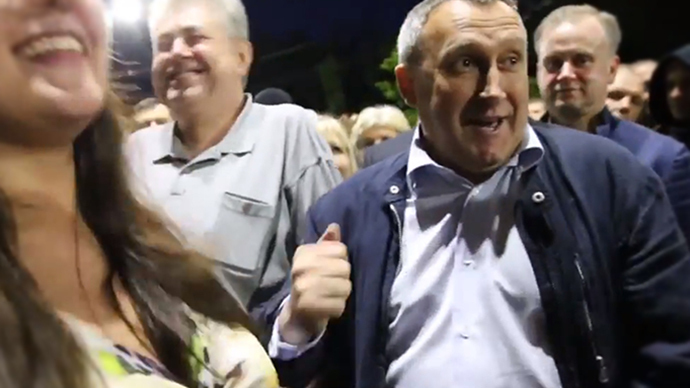 “Russia, Russia!” Ukrainian MPs started calling out in parliament, along with other suggested destinations. “Please do not insist on the country, we will pick one together with Deshchitsa,” the president replied. Poroshenko proposed Ukraine’s current ambassador to Germany, Pavel Klimkin, as the new foreign minister. His appointment was approved by MPs. 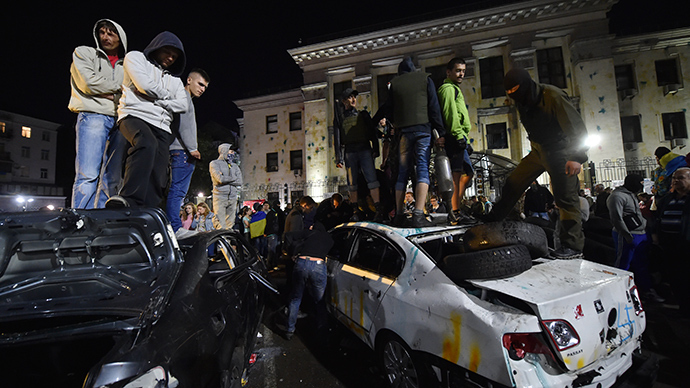 The diplomatic scandal blew up last Sunday as a few hundred Ukrainian protesters were rallying outside the Russian Embassy in Kiev. Deshchitsa joined the protesters, who vandalized the premises of the embassy. Their actions included overturning several diplomatic cars, piling up tires to block entry into the building, throwing stones, smoke grenades and eggs, and painting Nazi insignias. “In an effort to calm the people,” as he later explained it, Deshchitsa said: “I want to say: Russia, get out of Ukraine. Putin’s a f**ker, right!” His words were immediately picked up and turned into a football chant by the delighted mob. 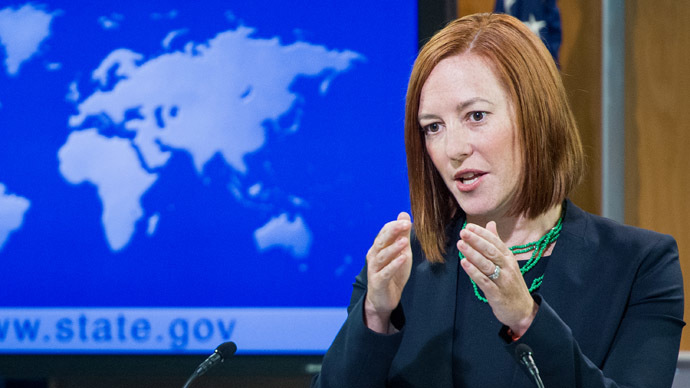 US State Dept. 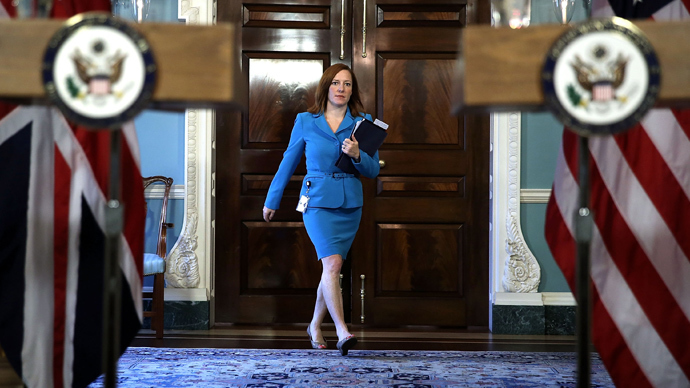 spokesperson Jen Psaki on Monday also defended Deshchitsa, saying that his swearing was justified by what it achieved.